'PK' Is Not India's Top-Grossing Movie Anymore! Baahubali Smashes its records! 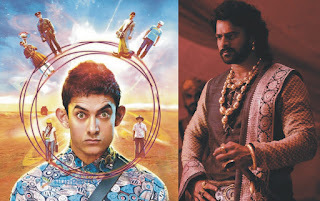 'PK' Is Not India's Top-Grossing Movie Anymore! Baahubali Smashes its records! Home > ss rajamouli > 'PK' Is Not India's Top-Grossing Movie Anymore! Baahubali Smashes its records! 'PK' Is Not India's Top-Grossing Movie Anymore! Baahubali Smashes its records! Yes, it's true as per recent reports PK is not India's top-grossing movie at Box Office anymore. This time Prabhas featuring action epic Bahubali : The Beginning has smashed the records of PK, and has topped highest grossing Indian film ever, after that PK and Salman's Bajrangi Bhaijan is second and third highest grossing films respectively. PK’s worldwide gross finished at 7.4 billion Indian rupees (US$114 million) earlier this year, and Bajrangi Bhaijaan and Baahubali, still both in release and adding daily to their worldwide totals, are at 5.94 billion ($91 million) and 5.66 billion rupees ($87 million) respectively, as of today. But by another measure—box office revenue in India alone—PK’s record as the most viewed theatrical film stands no longer. It has fallen to one of the more recent films. If you ventured a guess that Salman Khan is India’s new box office king, you’d be wrong. Against all odds, Baahubali: The Beginning, the first non-Hindi film to reach even the ranks of the top 10 biggest earners in theatrical release across India, now stands at the pinnacle, the highest grossing film in the country’s history. S.S.Rajamauli's directorial Bahubali has not only swept it's home language regions. It was released in Hindi and other languages too. Now the film is highest grossing Indian film ever.